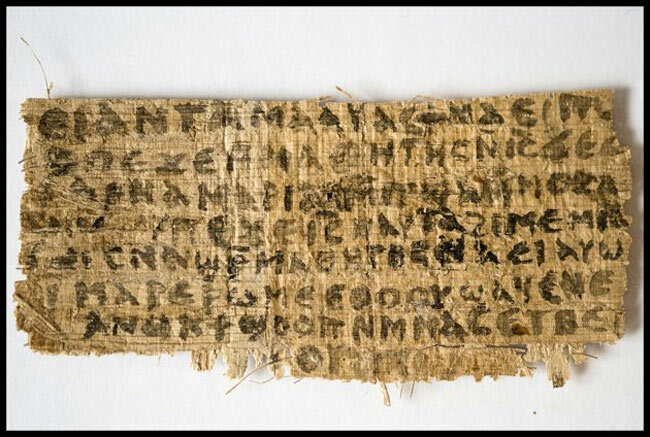 The "Gospel of Jesus' Wife" papyrus, which may or may not be a forgery, seems to be in limbo, as the Harvard Theological Review has pulled the scientific article describing the discovery from their January 2013 issue. This withdrawal, however, doesn't mean the journal will never publish the scientific paper by Harvard historian Karen King on the supposedlost Gospel. "Harvard Theological Review is planning to publish Professor King's paper after testing is concluded so that the results may be incorporated," Kit Dodgson, director of communications at Harvard Divinity School, wrote in an email to LiveScience. Even so, the announcement has garnered both anger and elation. Meanwhile, another scholar applauds the Harvard Theological Review for making King's study available online, if not yet published in their journal. "My personal opinion is that Karen King and Harvard Theological Review have significantly improved the traditional peer review process by utilizing the Internet," Oxford University graduate Andrew Bernhard told LiveScience. "In fact, this could potentially be a watershed moment in the history of scholarship where the academic process becomes more open and transparent." The business-card-size papyrus at the center of the controversy, described as "The Gospel of Jesus' Wife," by King on Sept. 18, was supposedly from the fourth century and written in Coptic, the language of a group of early Christians in Egypt. King and her collaborators believed the scrap, the first ancient evidence of Jesus speaking of a wife, was authentic. Two Coptic scholars — AnneMarie Luijendijk of Princeton University and Roger Bagnall of New York University — considered the text authentic and dating back to the fourth century, according to the Biblical Archaeology Society's Shanks. Bagnall declined to comment about the postponement of the journal article, until more information was available. Even so, in weeks following the announcement, skeptical scholars voiced their concerns the papyrus was a fake. For instance, Bernhard, author of the book "Other Early Christian Gospels" (T & T Clark, 2006), pointed out an eerie resemblance to another online translation of a Gospel. Bernhard, in a paper published online, found similarities such as grammatical errors and line breaks that have been found only in the online translation of the Gospel of Thomas. The Gospel of Jesus' Wife, Bernhard found, seems to be the work of an amateur who pieced together individual words and phrases from Michael Grondin's "Interlinear Coptic-English Translation of the Gospel of Thomas." To get to the bottom of the papyrus's authenticity, several analyses will be conducted. "The owner of the papyrus fragment has been making arrangements for the next round of analysis of the fragment, including testing by independent laboratories with the resources and the specific expertise necessary to produce and interpret reliable results," Dodgson wrote. "This next phase is likely to take several weeks, if not months." While Shanks says he has no issue with such scientific debate, including questions surrounding the papyrus (such as its date, authenticity and relationship with other texts), he does object to the journal's withdrawal of the paper. "When a professor at the Harvard Divinity School, backed up by two experts from Princeton and NYU who declare the text to be authentic, presents the case—and tentatively at that—that should be enough for HTR to publish King's article, not to cowardly suspend its decision to publish. Instead, HTR has cringed because there will now be a dispute as to authenticity," Shanks writes on the society's Bible History Daily website.